If you’re a commercial van upfitter, you’ve likely seen a growing number of customers who’ve traditionally selected a pickup or service body truck for a mobile service application, who are now taking a second look at using a van for that job. That’s because not long ago, in 2008, there were few commercial van options available in the North American market — three full-size vans (Ford E-Series, Mercedes Sprinter, and Chevrolet Express/ GMC Savana) and one compact van (Chevrolet Uplander cargo). Today, that number has more than doubled to 10 van models, offering a much wider range of roof heights, wheelbases, payload capacities, and engines for fleet managers to choose from. “We’ve definitely noticed an uptick of some customers switching from pickup trucks to vans because there is more choice now, especially with the new small vans and euro-style full-size vans that have entered the market the past few years,” said Jay Cowie, product manager at Ranger Design, a commercial van upfit manufacturer based in Ontario, New York. With the influx of new van models, how can you seize this opportunity to sell more commercial van products and services? Tailor your offerings to capitalize on these four trends in commercial van upfits. How can upfitters capitalize on this trend? Offer modular or adjustable cargo management systems so that technicians can personalize (or right-size) the upfit to their unique needs and workflows in the field. Reimagine how the increased cargo area inside high-roof vans can be optimized — to create new upfit designs that boost worker efficiency and productivity. Cowie said that Ranger Designs incorporates aluminum and composite materials to reduce overall upfit weight, depending on what mix of materials is best for the customer’s functionality, durability and budget requirements. Offer lighter-weight upfit options where the customer’s application allows. Help customers assess the cost-benefit of “lightweighting” in terms of productivity gains from increased payload capacity or the potential to “downsize” the vehicle and reduce acquisition costs. According to the U.S. Occupational Safety and Health Administration (OSHA), work-related musculoskeletal disorders (MSDs) — typically caused by awkward movements, heavy lifting, and repetitive motion — account for 34 percent of all lost workdays, which can get very expensive for employers. So, a growing number of fleet managers are looking to equip their vehicles with upfits that improve ergonomics to protect their technicians’ health — and their organization’s bottom line. Also, the upfit products themselves can be designed with ergonomics in mind. Take, for example, a bulkhead (between the cabin and cargo areas) that’s contoured to allow the driver seat to recline a few degrees further than a standard bulkhead, improving driver comfort and reducing risk of lower back fatigue. Another example is a drop-down ladder rack, which is especially helpful with the taller Euro-style vans because it enables workers to load and unload ladders from the side of the van, while standing safely at ground level, instead of having to strain and lift awkwardly to load a heavy ladder onto a standard roof rack. Educate customers on more ergonomic options to standard upfits, such as drop-down ladder racks, contoured bulkheads, grab handles, etc. Study how the vehicle is intended to be used in the field to uncover new ideas for designing upfits that help improve workflow and ergonomics. 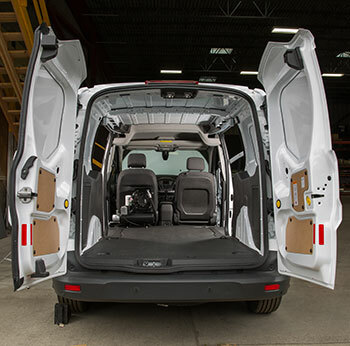 “We’re seeing a trend toward fleets wanting van interiors that offer a more productive mobile workplace, with increased demand for power ports to run laptops, charge mobile devices, and operate electric tools,” said Langley with Adrian Steel. At VMAC, we’re seeing similar growth in demand for air power in vans – for fleets that traditionally use pickups or service body trucks to run high-powered air tools, such as impact guns for breaking off heavy-duty lug nuts in a mobile tire service application. The challenge has been that conventional air compressor systems available for vans — electric drive and gas/diesel drive compressors — are either too underpowered or take up too much cargo space (and weight) to be useful for most mobile service applications. So, the VMAC engineering team has developed the UNDERHOOD 40 CFM air compressor (40 cfm/ 100-150 psi), designed specifically for the commercial van market, with a compact rotary screw compressor. 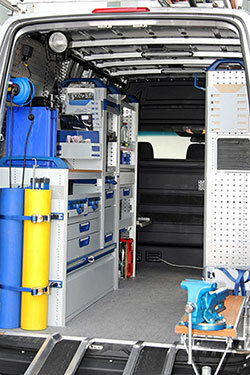 This system is powered by the vehicle’s engine to generate sufficient air power for a wide range of heavy-duty air tools, while minimizing the system’s footprint and weight inside the van’s cargo area. Expand your product offerings and expertise to account for your customers’ mobile power needs for commercial vans, in terms of electrification and air power. Help customers strike the right balance between maximizing onboard power, while minimizing the system’s weight and impact on cargo capacity. With today’s commercial van landscape, opportunities abound for upfitters that serve the mobile service market. So, as you evaluate your product portfolio, look for any gaps that, if you were to fill them, could open up exciting new revenue streams — and make your company more valuable to customers. Want to learn more? Read about your air compressor options for service vans!